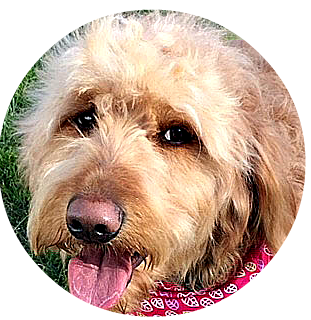 Molly is a golden-red F1 Goldendoodle, who is an easy-going, sweet-natured, willingly trainable girl. Molly gets along with everyone. Gusty is a white F1 Teddy Bear Goldendoodle. She has a delightful personality and is an altogether adorable girl. She has a wavy to curly coat that is easy to maintain. She has tight hips and normal elbows, based on radiological evaluation. Her sire is an AKC registered Standard Poodle, and her dam is an AKC registered English Cream Golden Retriever. Sunny is an AKC Golden Retriever with the eager-to-please, willingly obedient personality that has made the breed so popular. She has a luxurious dark-gold coat. Her PennHIPP rating is above the 90th percentile. So, it could not be better; i.e., her hips are tighter than those of more than 90 percent of Golden Retrievers. ​Henny is the sweetest, prettiest girl ever. 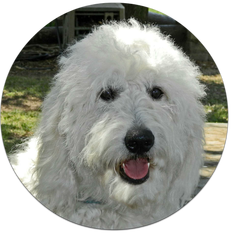 She is an F1b Standard Goldendoodle and has a beautiful curly fleece coat that is non-shedding and odor-free. Her sweet, loving nature is passed on to her offspring. ​Chloe is a chocolate Labrador Retriever with a rich cinnamon-hued coat. She is a loving, sweet girl, who adores walks and games of fetch. She is OFA certified for "good" hips and normal elbows. Buyers comment about the high intelligence of her offspring. Lindy is a charming Cavachon with a beautiful soft coat. She and Rusty have adorable Cavapoochon puppies. Lindy's sire is an AKC registered Bichon Frise, and her dam is an AKC registered Cavalier King Charles Spaniel. Knees have been evaluated by our veterinarian and found to be excellent. Tyra is our tri-colored Cavachon with a lovely, non-shedding coat. She is seventy-five percent Cavalier King Charles Spaniel and twenty-five percent Bichon Frise. She has a friendly, happy personality, and is smart and obedient. Her knees have been evaluated by our veterinarian and found to be sound. Her weight fluctuates around 20 pounds. Lottie (AKA: Charlotte) is an F1b Petite Goldendoodle with a huge personality. When we brought her home as a tiny puppy, she walked into the house and announced, "I'm the queen now!" She is bold and confident but loving and cuddly. She not only is adorable, but super smart. Her knees are sound, per veterinary evaluation. She weighs 15 pounds. Brandy is an AKC registered Imperial Shih Tzu, as sweet and loving as she is beautiful. She adores playing with children, especially when play involves water. She weighs 16 pounds. Lulu is an AKC registered Cocker Spaniel. She is playful, charming, and pretty as can be. She weighs 18 pounds.